Results from Eastbourne Magistrates’ Court, sitting at Hastings, for January 7 - January 14. Gary Draper, 43, of Turney Road, Southwark, London, pleaded guilty to driving a BMW on the A22 at Eastbourne on April 1 last year, over the speed limit. 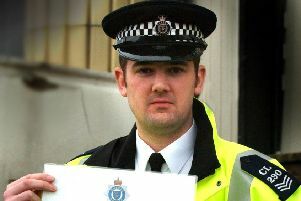 He was fined £250 and his driving record endorsed with three penalty points. Niall Donachy, 25, of Winchcombe Road, Eastbourne, pleaded guilty to assault by beating and to using threatening behaviour. The offences took place at Eastbourne on April 14 last year. The court made a community order with an alcohol treatment requirement. He was ordered to pay £300 in prosecution costs. Cameron Hesling, 18, of Alverstone Close, Eastbourne, pleaded guilty to driving a BMW on Shepham Lane, Polegate, on December 8, while over the drink drive limit. He gave a breath alcohol reading of 48 micrograms. The legal limit is 35 micrograms. He was fined £318 and banned from driving for one year. Sam Lee, 22, of Leslie Street, Eastbourne, pleaded guilty to sending a threatening communication to a woman. The offence took place at Eastbourne on September 25. The court made a community order. Magistrates also issued a restraining order. Stuart Walton 25, of Ringmer Road, Seaford, pleaded guilty to harassment in making six calls to his victim. The offence took place between November 21 and November 27 last year. The court made a community order with a requirement of 100 hours of unpaid work. The court also made a restraining order. Daniel Creasey, 26, of St Johns Road, East Grinstead, pleaded guilty to driving a Citroen vehicle with cannabis in his blood stream. The offence took place at Saxby Close, Eastbourne, on July 20. He was fined £335 and banned from driving for one year. A 17- year-old Eastbourne youth who cannot be named for legal reasons, pleaded guilty to assaulting a woman by beating her. The offence took place at Eastbourne on September 25. He was referred to the East Sussex Youth Offenders Panel for a six-month period.